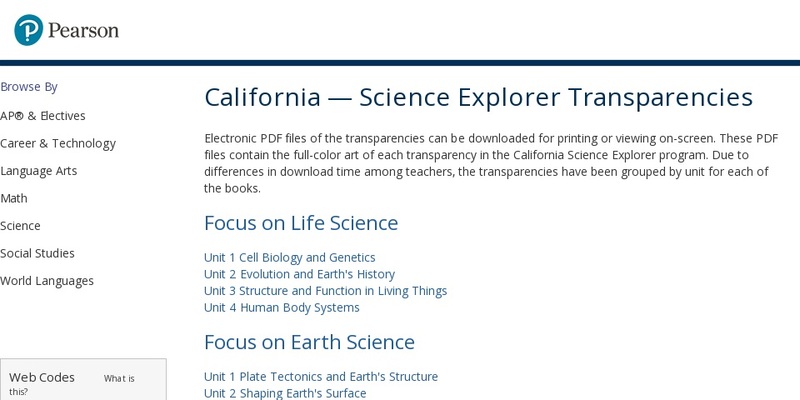 This collection of transparencies features materials for life science, earth science, and physical sciences. The transparencies are downloadable and printable, or can be viewed on-screen. Earth Science topics include plate tectonics and the Earth's structure; landforms and weathering; water, hydrology, and weather; and ecosystems and food webs. Life science topics include, among others, evolution and the Earth's history, and structure and function in living things. Physical science topics include motion, forces, and energy; sound and light; and electricity and magnetism.